This is a completely gratuitous photo of me in my living room, taken because a) I liked the light coming in through my window, and b) because it shows the awesome drawing I purchased at an exhibit of work by my friend and local artist, Brian Lambert. The background is a cemetery in New Orleans and the elderly woman in the foreground had some powerful mojo going on. When I saw the drawing in the show, I figured you can't have too many strong women in your life, and she needed to come home and live with me. I was feeling rather sassy myself yesterday, and it was finally warm enough to forgo a jacket! I layered a summer dress over a skirt, and topped it off with the hat/fascinator I got at Fashion Crimes in Toronto last fall. I took it to New York with me, where it was ardently admired, and it needed a outing. The fabric is oddly flexible and can be twisted into different shapes, and it's all attached to a hairband. Unfortunately, the hairband is a bit large, and it doesn't stay on very well. Anyone have any suggestions on how to remedy this? I don't have enough hair to anchor it with a clip or comb. My friend Heather, who took the photos above, and I had our usual apple fritter at the Farmers Market and I saw a young woman in a kaleidoscope of colours and pretty much followed her around the market until I could take her photo. She was very charming, and knew who I was, as apparently I had photographed her over a year ago. Her photo will be my in my next post. The label says "Imported from the British Colony of Hong Kong", which means it was definitely made before 1997, but from the style of it, I'm thinking closer to the 60's when these beaded tops were quite common. I've always wanted one, but they are completely impractical to wear; not only are they heavy, but also difficult to clean. 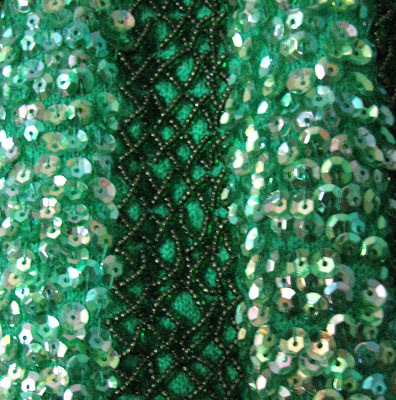 I liked the colour of this one, and the mix of sequins and beads (see closeup below). That is one great and beautiful outfit and I love your new and compelling drawing. What an inspiration to add to your daily life. And the hat! The word that comes to mind - spectacular! The painting is magnificent and I love the color of your living room walls. 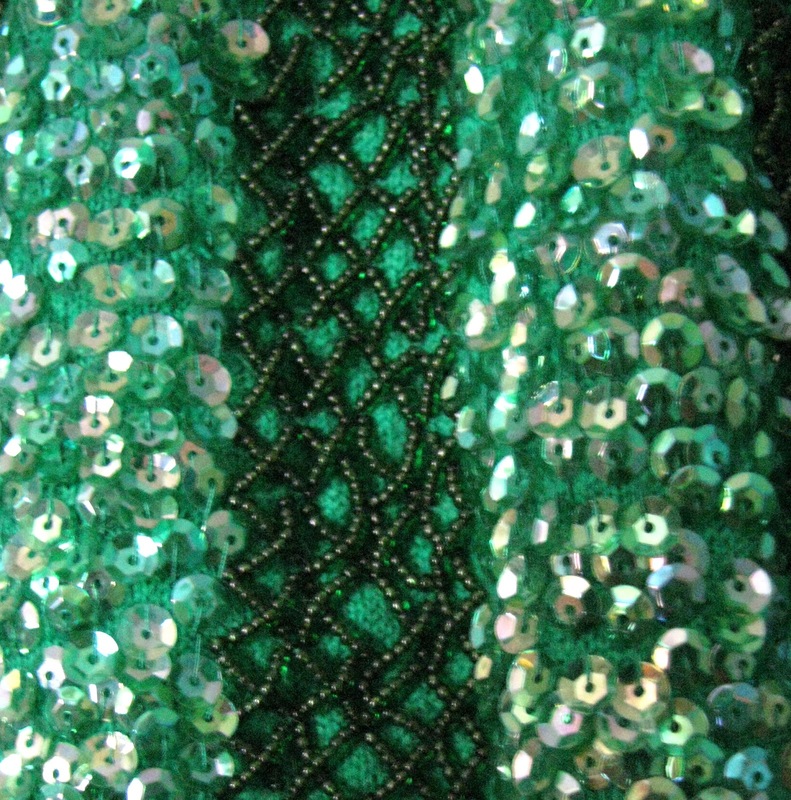 Your outfit is very cool (I especially like the sandals with it) and I LOVELOVELOVE the green sequined top. 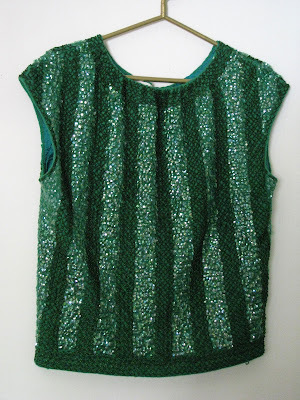 I am craving sparkly right now and the green color put this piece over the top. Those sandals and top go so perfectly together and they suit you as well. Perfect! I love purchasing new art. I think we know right away when we connect to a painting or drawing. Sometimes it's so strong we can feel it physically. You do look rather sassy in your lovely layered look and that wonderful fascinator. I think someone should paint/draw YOU! It's a mesmerizing sketch and a dramatic photo! I like the summer dress as a tunic. Hi Shelley - outstanding outfit! love the layering and love the head scarf, looks so good on you! 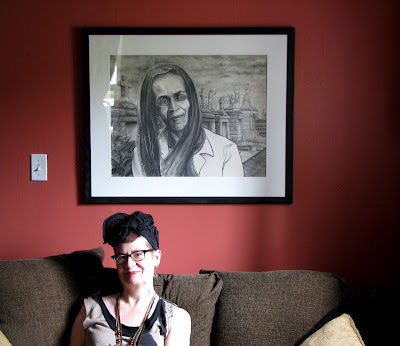 Love the pictures of the artist, i had a look at its website - neat!